Every pregnancy I am NOT extremely tired and achy in the beginning. My house is NOT a disaster. My kids have NOT been running around in their underwear because they are out of clean clothes. I did NOT let my fish tank get so dirty that you can't see the fish. I do NOT still have the seats from my van in my living room that we took out 3 weeks ago to go camping. I have NOT been taking naps with my kids instead of making my house livable. I did NOT write this while my kids were whining that they want some food. 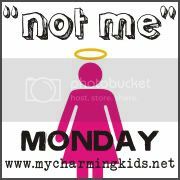 I hope this is what a not me Monday should be. If you want to give it a try too click on the button at the top to go to MkMama's blog and join the fun. Sorry you don't feel well! A clean house is overrated anyway! :) Now, go take a nap! Btw, you have a cute family!